Installation of the CD was relatively straight-forward for a PC -- not something you'd want your five year-old trying for the first time, but without any major gotchas. Initial use, however, was somewhat more challenging, especially if you tried to do it as most users do (i.e. without opening the manual). The principal intuitive challenges were (1) to figure out how to rotate the skeleton and simultaneously select the body system you were interested in, and (2) to determine what the different boxes were for in the Theater. A somewhat less difficult problem was how to use the 3D glasses that came with the software. We decided the best way to solve that problem was to carefully fold them and return them to the box. Body Adventure has some really great graphics. The computer generated fly-bys and fly-throughs of 16 different body parts or systems are absolutely great, as is the ability to manipulate certain body parts in the imaging gallery. And to the extent the body part you were interested in was covered, the software was clearly educational. Is it fun? Our kid reviewers thought so, in spite of some parent and teacher concerns about limited breadth and the resulting repetitiveness of a child's experience. 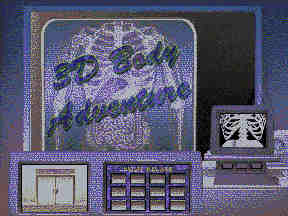 3D Body Adventure is a neat program for middle-aged children (10 to 15) who you would like to interest in human anatomy. Although not broad enough to be a reference tool or guide, it does an exceptional job at presenting a tantalizing picture of the construction of the human body.